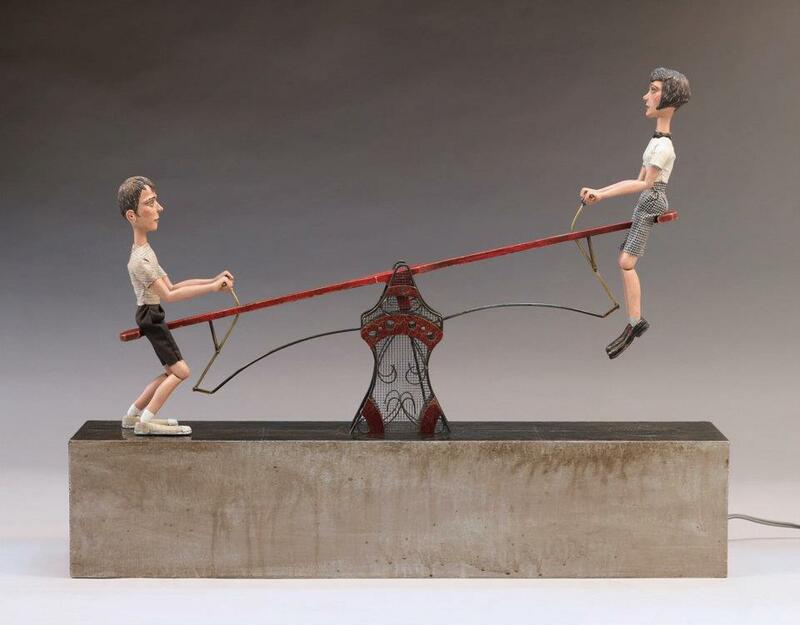 Pif’s June Artist Interview features Tom Haney, a creator of figurative kinetic artwork, called automata. His artistic process is incredibly involved, yet his clarity in providing details will attract, inspire, and entertain. His creations, both delicate and hypnotic, are sure to amaze. 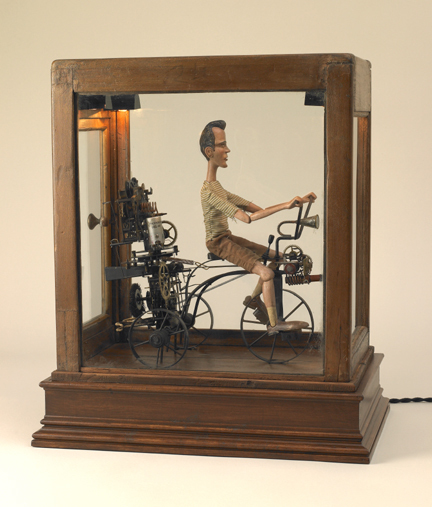 Automata can be traced back to the early Greeks, and were inspired by the work of early clockmakers. 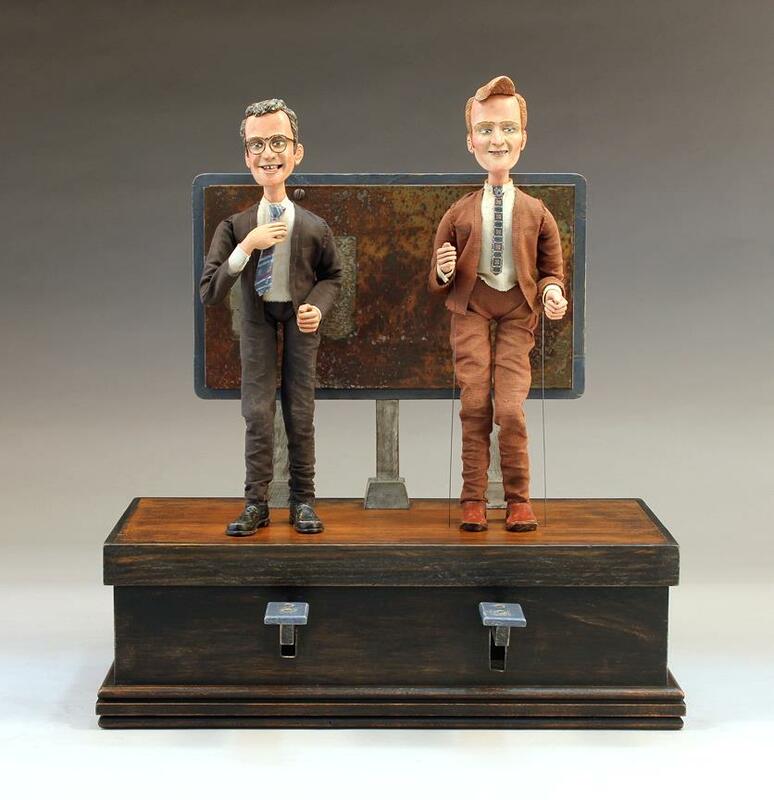 They are self-operated, electrically powered figures that precisely imitate human movement. Dependent on complex, hand-made, hidden mechanisms, they are specifically crafted for each desired motion, and then programed to perform repeatedly in a desired sequence. Movements can range from very simple to extremely complex, and the figures themselves come in many shapes and sizes. Haney spent his early years taking things apart, and putting them back together (every parent’s dream). He was fascinated by anything mechanical and used high-school art class as a creative outlet. 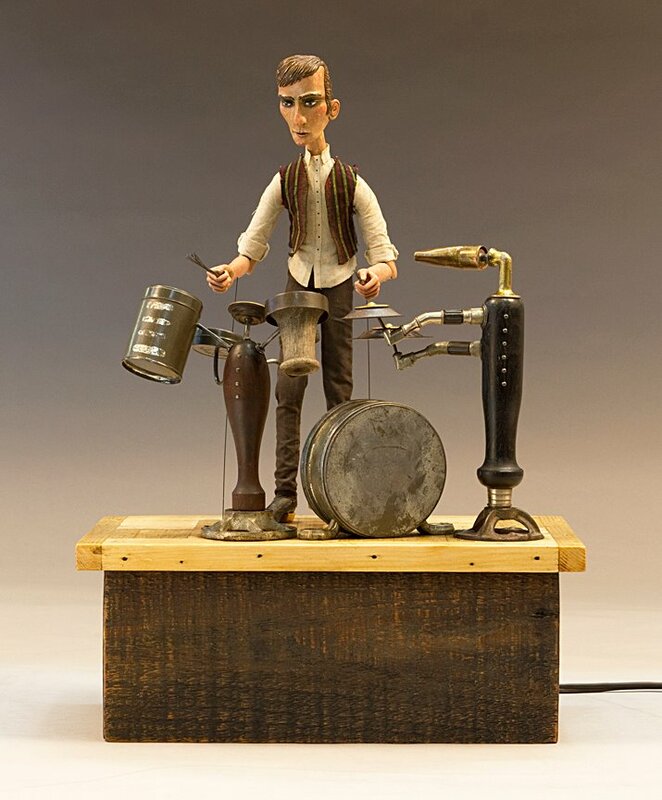 With a college degree in Industrial Design, he was a prop/set designer for television commercials (including the marionettes for TNT’s “Rudy and Go-Go’s World Famous Cartoon Show”) before becoming a full-time artist in 2000. In creating his art, Haney strives to connect with the past using discarded, obsolete artifacts, old tools and traditional techniques. 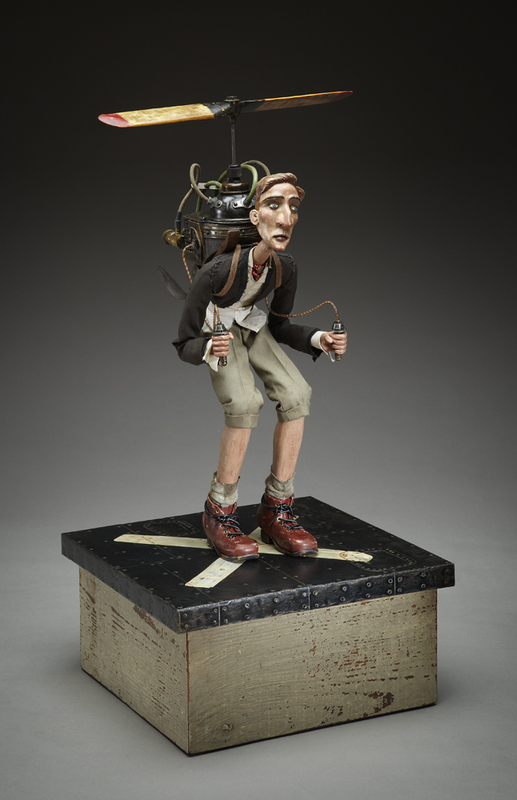 He believes the magic of mechanical movement captures attention and allows the viewer to collaborate with him in interpreting stories from their own personal experience, suggested by the piece. Stories are at the heart of Haney’s art, especially narratives highlighting the perseverance required to overcome life’s obstacles. 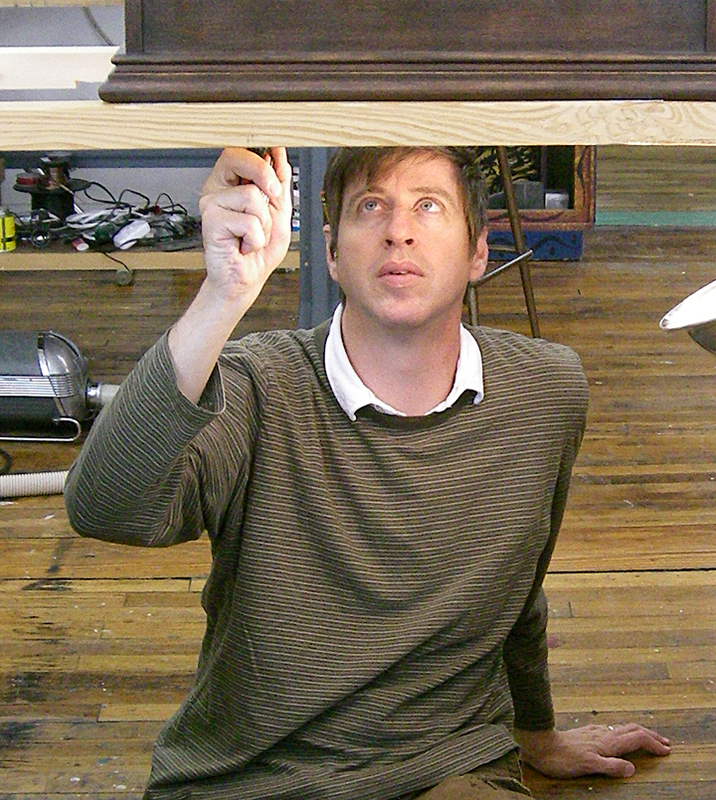 Tom Haney: I was born and raised in Cincinnati, Ohio and currently reside in Atlanta, Georgia. EF: How long have you been involved with art? What is your background in art? TH: You could say I’ve been involved in art my whole life. I come from a big family and a few of my older siblings also pursued creative lives. As a child, my creativity was nurtured; everyday in high school I looked forward to my escape – time spent in art class. In college I studied Industrial Design. EF: What led you towards art as a career? 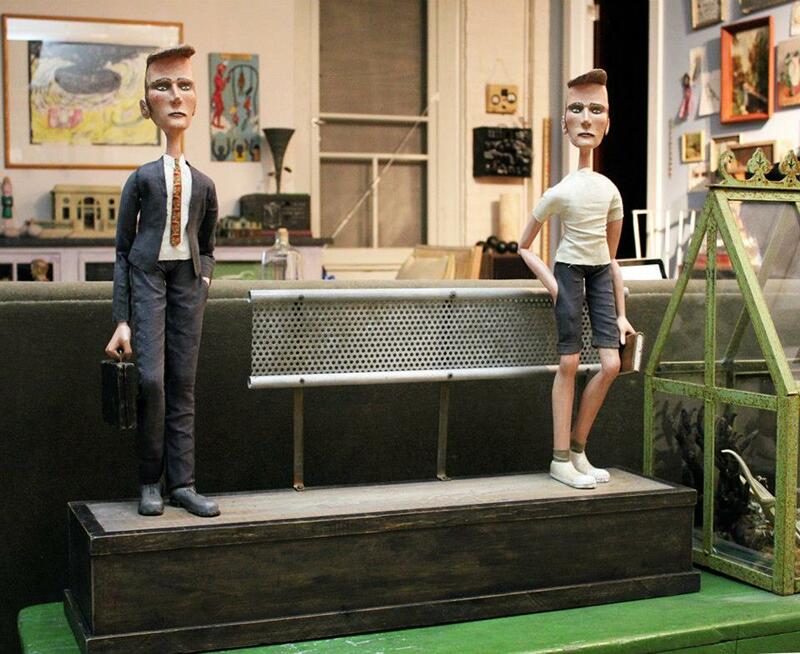 TH: After college I was employed as a prop/set designer and fabricator. I pursued art in my spare time. In 1999, after some serious soul-searching, I came to the conclusion that since art was what I’ve always wanted to do; I would stop what I was doing and jump into the art world feet first. EF: Did you always want to work within kinetic art/automata? TH: Even at a young age, I found any work of art incorporating movement much more compelling than it’s static counterpart. Specifically Alexander Calder’s work left quite an impression on my young mind. EF: How did you get started creating automata? 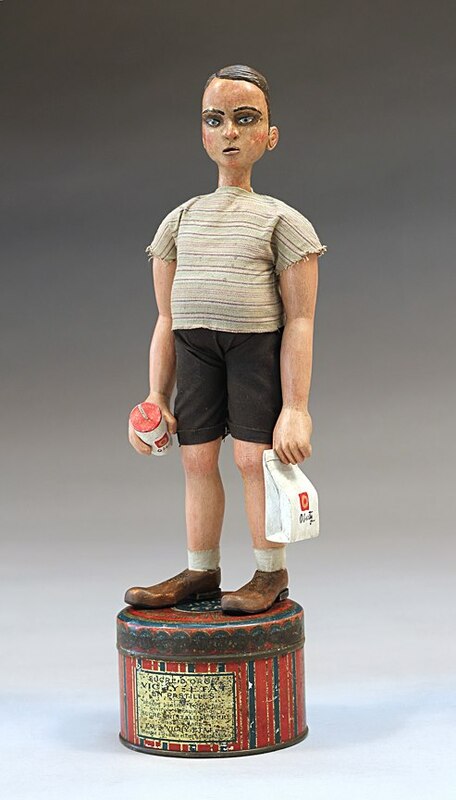 TH: My wife, Paula Joerling (also an artist), and I moved to the south in 1992. We began making whirligigs after having seen them in a folk artist’s yard. A couple of years later I saw a man who incorporated carved wooden figures into his whirligigs. I decided to teach myself to carve and to make articulated figures. EF: What is the origin of this style of artwork? 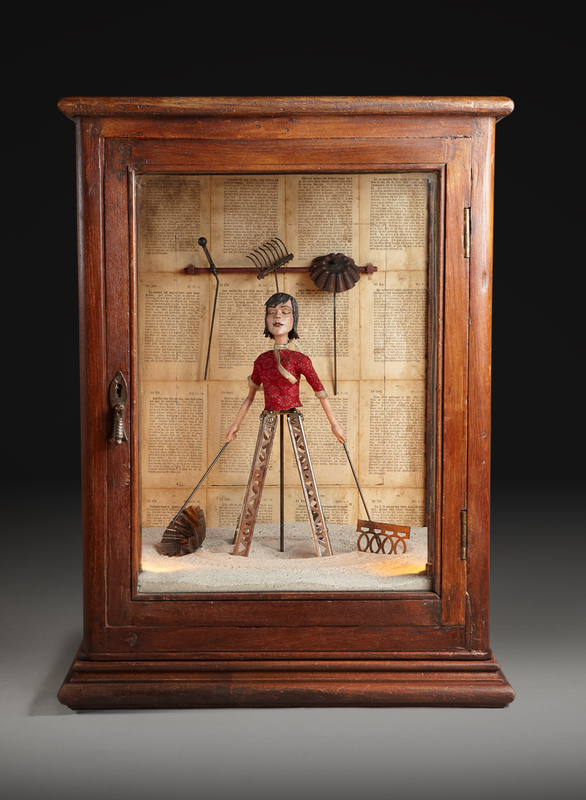 TH: Automata has been around for centuries but really came into it’s own in the 17th century, born out of the imagination of clockmakers. EF: Did you have a mentor? TH: No, not really. But Dr. Ben Thal was the man I first saw doing figurative whirligigs in the early 90’s. Early on I tried to emulate the many southern woodcarvers whose work I’d seen. EF: What do you call your medium and how would you define it to a novice? EF: Walk us through your creative process, from inception to execution (watch “Epiphany” to see his process). TH: First I try to think of a narrative that has a purpose-driven movement to it. Today I lean heavily on the narrative, but when I first started, it was more about what’s possible, movement-wise, with a figure. 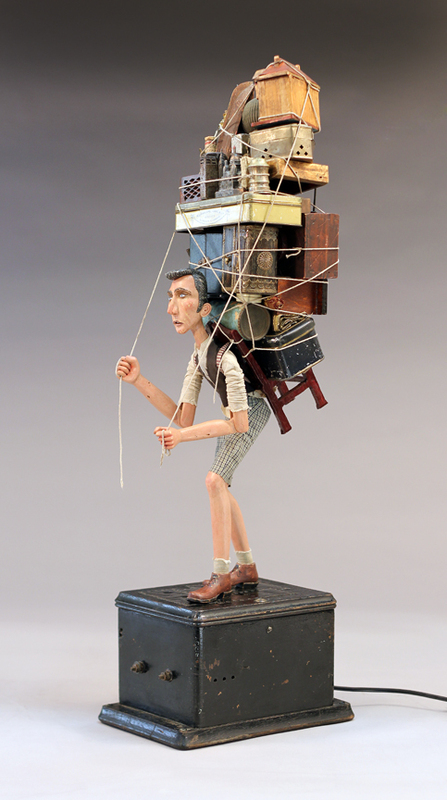 I do simple sketches of ideas, and often just jot down the concept – ‘a man carrying a heavy shifting load on his back’, for example. When I begin a new piece, I draw out basic dimensions and whatever I need to get started carving. I make the figure and move on to the mechanism, though sometimes they have to be developed simultaneously. After the figure and the mechanisms are finished, I paint, make the clothes, and finally, assemble everything. Sounds simple right? It’s actually quite labor intensive. EF: What inspires your creations? Where do you get your ideas for a piece/collection? TH: When it comes to my artwork, I always have my eyes and mind open to new ideas. Oftentimes my ideas come from things that are totally unrelated to my work –a scene in a movie, a song, something a friend says – I collect all these bits of inspiration and file them away. 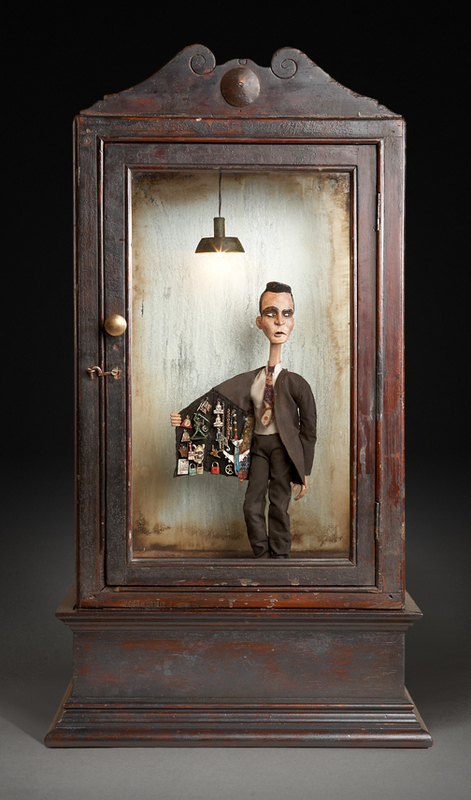 Sometimes the story I want to tell drives the piece, but also I like to think of things that I’ve never seen done with an automaton; I like to challenge myself that way. EF: Some artists hide their techniques, creating a mystique to their process. On your blog (and facebook page) you are extremely forthcoming, providing detail with photos, videos and written explanation. Why are you so gracious in sharing the method behind your magic? TH: I have no secrets and I’m not doing anything that many others haven’t already done. The way I put it all together – using the invisible methodology we all employ – is what makes my work unique. Other people can take what I do but would end up with a completely different result. I believe everyone has his or her own distinct sensibilities. I share, because others have shared with me, and I think what I’m doing is worth sharing. Man has only progressed from his willingness to share information; what is the point of him doing the opposite? Also I want people to see how much work goes into each piece. EF: If you had to pick one piece to best describe who you are, which would it be and why? TH: “Undaunted” – in some ways it could almost be described as a self-portrait. EF: For whom do you create? TH: Firstly I create for myself. My heart has to be in it and if I have the mindset that the piece I’m making is for me, then I’ll do everything to make myself happy. Is there any other way to make art? EF: Who is your audience? TH: I would say everyone – everyone can appreciate what I do, but it takes a special person to understand and ultimately, collect my work. For many people it’s not initially a familiar form of artwork. It’s not an oil painting, a bronze sculpture or a piece of glass. These things people have seen before and understand what they are. With my work, it takes a bit more to understand and appreciate. EF: On average, how long does it take to finish a piece? TH: Small pieces I can finish in less than a week; larger pieces usually take 3 to 4 weeks or more. Much of the work I do is not apparent. 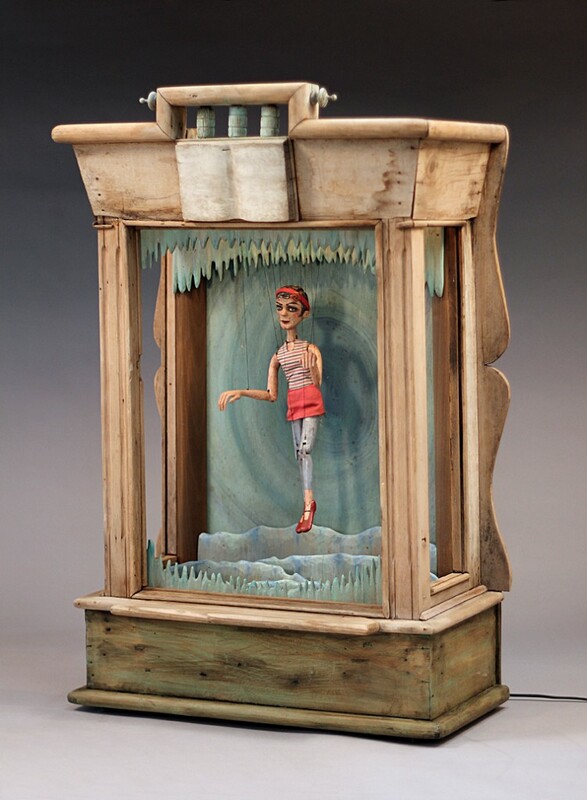 It is hidden inside the base with the mechanisms and underneath the clothes of each figure. My collectors understand that I build my pieces to last a lifetime. They appreciate my attention to detail and the time involved. EF: Recently you created a music video for a band called Little Tybee. How did you come across this opportunity? TH: Brock Scott, lead man for the band, has been a fan of my work for a while and he contacted me about contributing my artwork to a video project. Initially I thought he wanted to shoot some of my existing pieces for the video but it turned into a collaborative project that we created from scratch. 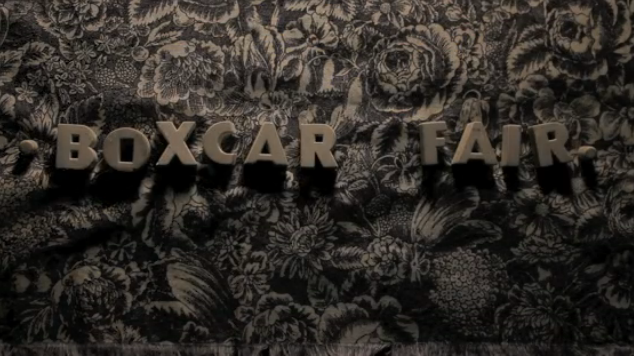 The video is called “Boxcar Fair”. EF: What were you required to do for the music video and how long did it take to complete? 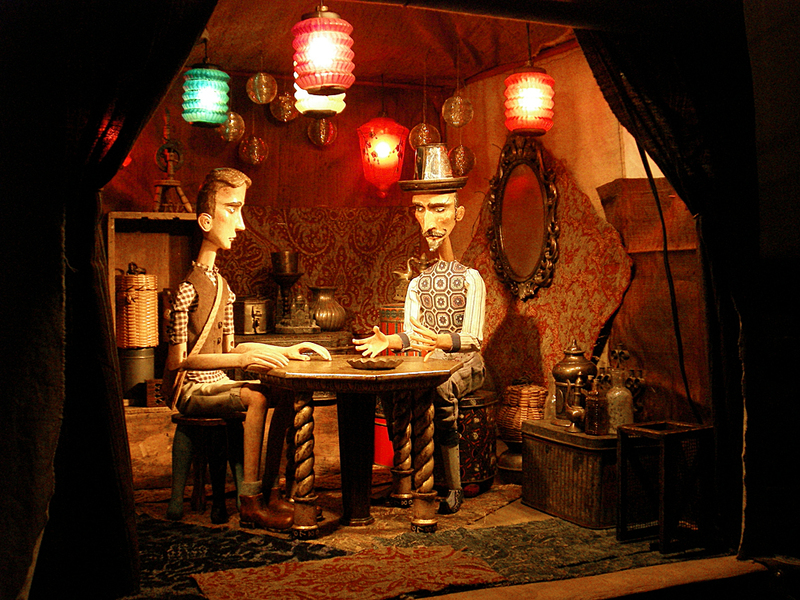 TH: I made 5 fully articulated marionettes and built a 45-foot long set with many props and set pieces. The physical work took 4 1/2 months; planning and wrap-up took another month. EF: Did you work independently or with assistance? TH: I did have some help building the set and a few of the props. EF: How did these creations differ (if at all) from your regular kinetic artwork? 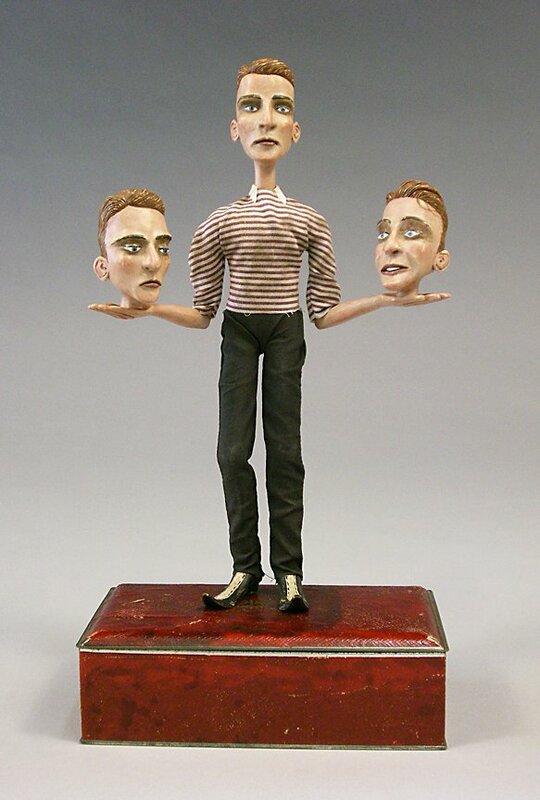 TH: Because they had to perform various movements, the figures were more complicated than any of my typical figures. I also made an articulated anglerfish and elephant from materials I don’t normally work with – wire mesh and Styrofoam, respectively. EF: Can you tell us a little about the upcoming music video you’re working on for Lucy Schwartz? TH: Lucy, a singer/songwriter from Los Angeles, saw “Boxcar Fair” and wanted to make a music video using a figure of my creation. 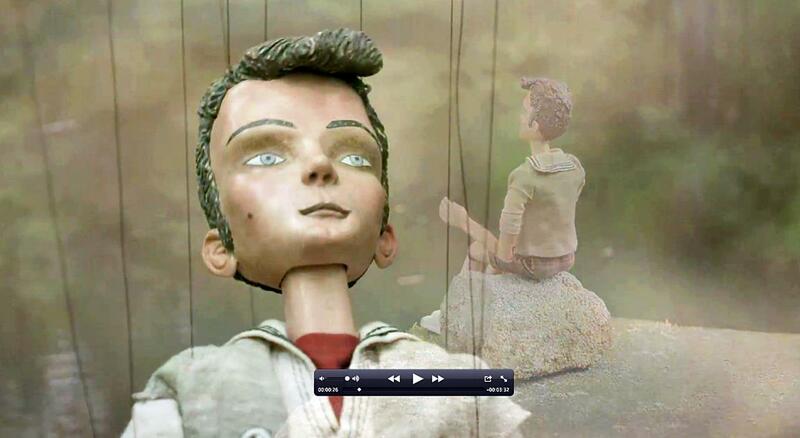 Her video, “Time Will Tell”, is a bit simpler, using only one marionette to play several roles. Together we came up with a concept and story. I had to wear many hats in it’s production – fun, but at the same time challenging. EF: How do you promote your work for public viewing? TH: I promote my work through my website, including my Mailing List, my blog, and through Facebook and Twitter. I make every effort to keep my postings current and relevant. EF: Do you seek out exhibition opportunities or do they come to you? TH: I try to keep my ear to the ground but most of my recent exhibitions have been coming from people seeking me out. EF: Do you become attached to the characters you create? TH: Sometimes I do become attached, more strongly with some than others, I’m not quite sure why. It probably has to do with the face and personality of each figure. EF: Do you have “empty nest syndrome” once they find a new home? TH: Not as much as you would think – as I’m working, I invariably realize each piece will eventually find a new special home. EF: Is movement essential to your art? Do/would static figures ever satisfy? TH: Movement is not always essential; it used to be but now I’m trying to see the movement as an added bonus. I want my pieces to stand on their own aesthetically – and have the movement serve as an added special part of the piece. Besides, my pieces are not meant to be running all the time. A lot of time goes into the mechanical movements and now I’m trying to find a good balance between mechanisms that are not seen and the overall appearance of a piece. And yes, I do create static pieces that are creatively satisfying. EF: How is motion created and maintained (how long do they remain in motion)? TH: Nowadays the motion is created by the use of electric motors and they run as long as they are turned on. In the past I’ve created pieces that are much more interactive – using keys, cranks and even wind-up motors to create the movement. From time to time I still make pieces this way, usually by request. TH: With each new piece I try to include an element that is unique to that piece. It might be a technique or a mechanism I’ve never tried before. Right now I’m thinking a lot about what’s my next big step. Where do I want to take my work? The answer is in there; it just has to boil to the surface. EF: Are a lot of your creations commission-based? TH: I would say about 30% of my work is commission work. EF: You frequently make videos of your pieces in motion, detailing how they were created. How do you go about choosing music to accompany them? (i.e. “Home” – really enjoyed this one). TH: Music is a big part of my life and although I don’t have a huge music collection, I do possess a wide variety. I try to choose the music based on the movement and feel of each piece and try to match it to the overall impression I want to make. EF: What creation (I know this is a tough one) is your favorite/you’ve been most attached to? TH: Again, I think “Undaunted” is my current favorite. It just came out so well, it’s immediately readable and has a great and personal message behind it. I have a huge poster of it (left over from a galley show) hanging outside my studio, so I see it everyday. EF: Tell us a little about your show at Obsolete in Venice, CA called Undaunted? Was that your most recent exhibition? TH: I had a show at Obsolete in 2010 called Undaunted. My most recent show there, back in September 2012, was a 2-person show with a painter named Tyson Grumm. For this latter show I was inspired to break out of the box, to create pieces that were not confined to a well-defined space. One of my pieces, “Undercurrent”, is more of a site-specific piece. It consists of two kinetic elements connected by a single strand of rope. More recently I had several pieces on exhibit in the SCOPE pavilion at Art Basel in Miami as well as showings in New York, Los Angeles and San Francisco. EF: Do you more frequently create collections or solo pieces? TH: Solo pieces, unless I have a gallery show. Then I try to come up with pieces that have a common thread. EF: Why polymer clay for the heads and wood for the bodies? Why not polymer clay for the whole figure? 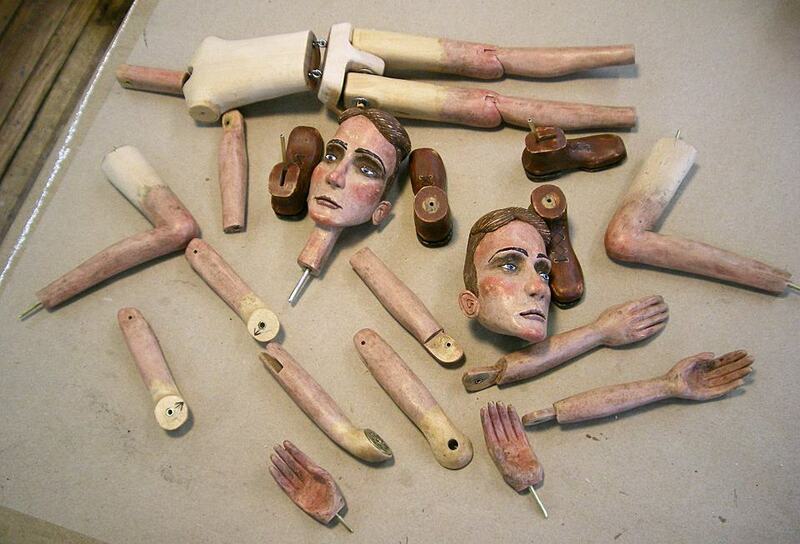 TH: When I began carving, I carved all of the parts of the figures from wood, and I still love the process. In 2005, after being frustrated with the expressions on some of my heads, I tried polymer clay. With wood, one can only remove material but with the clay I can play around with the expressions and really develop a personality. EF: Where do you get props/creative accessories for your pieces? Do you make or repurpose them? TH: Before 2005, my “rule” was that I had to make every element of my artwork. 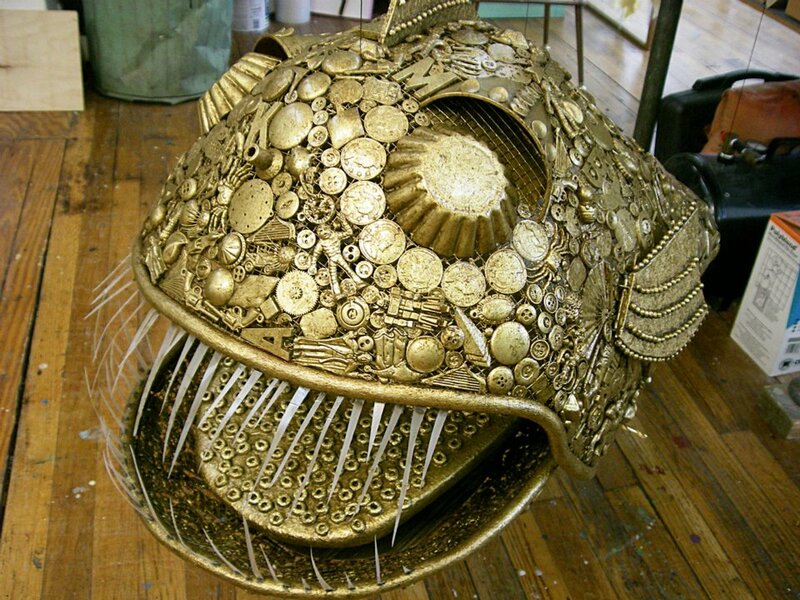 I love found objects and admired the work of a few artists using them. Found in antique stores, flea markets and thrift shops, I added them to my mix after a time of collecting. I like to use nondescript pieces that can stand in for objects more on the scale of my pieces. The great thing is that they’re usually already perfectly aged and distressed, so it saves me that step. EF: Do you ever collaborate with other kinetic artists? TH: So far I have not, but would like to see what might come of it. TH: Yes, of course. Currently my prices range from about $1500 to over $10,000. TH: I did 2 pieces years ago (one was a version of the other) that consisted of 3 percussionists and a dancer. The drummers played a beat I “programmed” with my computer and the figures were moved by cams and levers powered by an old wind-up Victrola motor. Figuring out how to get the information transferred from a high-tech form to a decidedly low-tech configuration was very gratifying. I delighted in seeing the hands of the drummers playing perfectly synchronized for the first time. TH: My heroes have always been the pioneers, the inventors – Edison, Bell, the Wright Brothers – in the art world, the innovators – Calder, Picasso, Tinguely. The great Leonardo DaVinci, who did it all – painter, sculptor, scientist, engineer, and architect – was who I wanted to be when I grew up. EF: Do you have a favorite piece of art? TH: We own a piece of Kevin Titzer’s work that is amazing – it looks great, has a great narrative and I love all the work in the piece. To simulate clothing, he nails many small pieces of tin onto his carvings (like me, Kevin not afraid of hard work). We also own a wonderful oil painting by Mike Davis; it occupies a special place in our home. 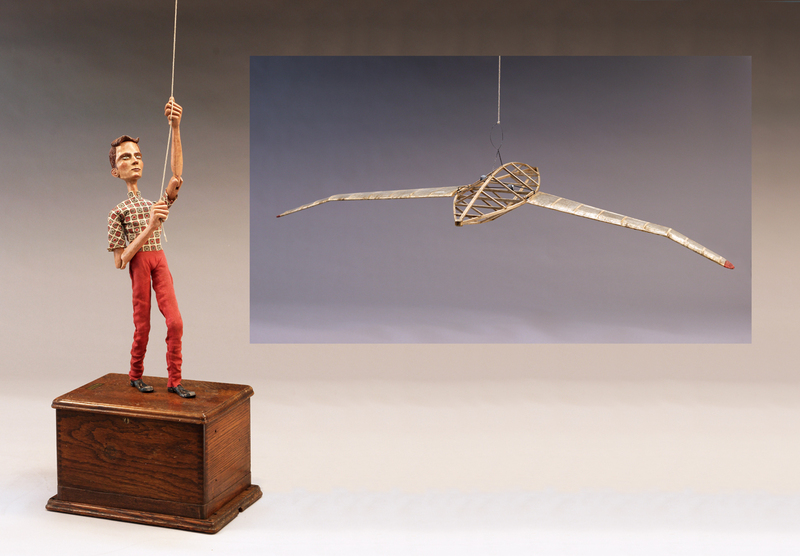 TH: Maybe not the best ever (that’s hard to put my finger on) but very memorable – when I was starting out Steve Armstrong, another kinetic figurative artist, encouraged me to continue making my art because not a lot of people could do the kinetic part. TH: Of course I love books about artists. One of my prized possessions is one about the kinetic artist Jean Tinguely. I also have books on Calder and da Vinci. EF: What is next? Are you working on anything new? TH: Currently I’m working on a self-portrait; a commission from friends and over the summer I will be making pieces for a small show in Massachusetts that opens in the fall.